We're coming up on the anniversary of the Aurora shooting in just a couple days so, considering recent news from MGM Resorts International, I thought it would be as good a time as any to discuss how expensive it can be to be a victim or survivor of a deadly attack these days. In case, you hadn't heard, MGM is suing hundreds of victims and survivors of the Mandalay Bay shooting on the Vegas strip last October has decided to preemptively sue the survivors of the shooting "to avoid liability." Sadly, this is nothing really new. Precedent was set a couple years ago in June when Cinemark announced they would be suing survivors for $700,000 to recoup legal costs incurred as a result of the tragic event that transpired during a screening of Dark Knight Rises that claimed the lives of 12 and injured 70 besides. MGM's Mandalay Bay casino-resort is now the site of the deadliest mass shooting in US history. In MGM's lawsuit, they claim "no liability of any kind" to survivors and families of the dead. Anyone who has or has threatened to sue as a result will be immediately in the cross-hairs of MGM's legal sharks in suits filed in Nevada, California, New York and elsewhere. MGM bases part of its claim on the fact that its security vendor, Contemporary Services Corporation (CSC) was "federally certified" by the Department of Homeland Security. 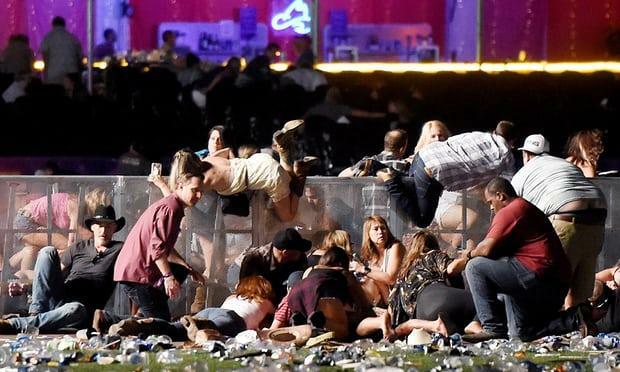 “If defendants were injured by Paddock’s assault, as they allege, they were inevitably injured both because Paddock fired from his window and because they remained in the line of fire at the concert. Such claims inevitably implicate security at the concert – and may result in loss to CSC,” the MGM lawsuit states. My favorite line is "as they allege." Ha, this should be great for the false flag/everything is a hoax crowd. Not to say, I buy the official story of the events. For that matter, you'd have to pick a <i>version</i> of the official story that you wanted to believe in first and since it seemed to change every few hours for a couple of weeks, that would take some time. MGM's suit hopes to hold that US law "precludes any finding of liability" against them "for any claim for injuries arising out of or related to Paddock's mass attack." Notice they don't say Paddock's "alleged attack" despite the fact he was never tried (not to even get into the other weirdness and inconsistencies). Yeah, sure, blame the conveniently dead man while "alleging" that anyone else who died or was shot maybe did it to themselves so they could sue the casino? Yeah, sure, I guess. Attorney Brian Claypool has called this a "hypocritical maneuver" that could turn into a "public relations nightmare for MGM" but let me ask you this, do you think it really hurt Cinemark that much? its all about the $$$$ greedy holes! theyll get theirs money is the root of all kinds of evil tbings! sooner or later it will happen! Fox McCloud and I be coming for you white cracker devils.